Truck hit 12,000 mi, and I decided to try this stuff and an ea filter since it seems to have solid reviews by many on here. Ticking on initial startup seems to be gone, so I'm happy about that. I think next big service item will be new diff fluid. I've seen anywhere from 15-20mi recommended for diff service, what seems to be the general consensus? 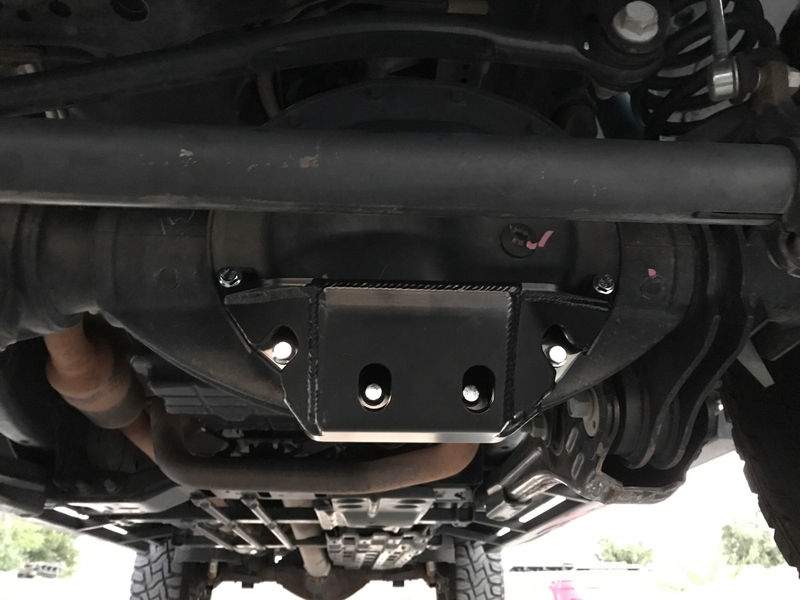 I figure it can't hurt to do it a little early since it has seen a bit of use in 4x4, might relocate the breathers while I'm at it as well. 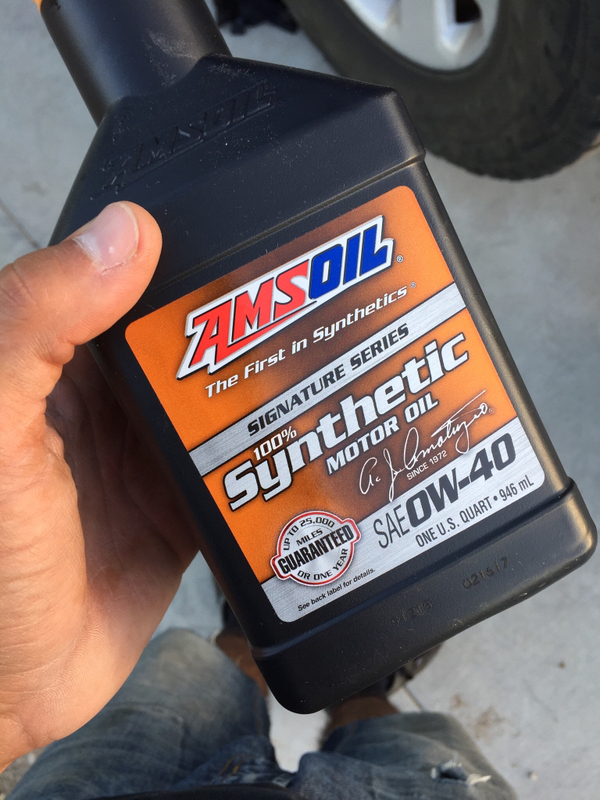 I've been running amsoil severe gear in both diffs for the last 200k km. I've changed the rear twice and the front once. I check the oil every 20k km and the rear was changed at 90k km and I did the front change at 150k km. I've done my front and rear diffs every 25k miles. I did my last one about 15k miles ago at 50k. Cool, sounds like I have some miles left before spending the money on gear oil. Maybe I'll do diff covers when it comes time for oil. 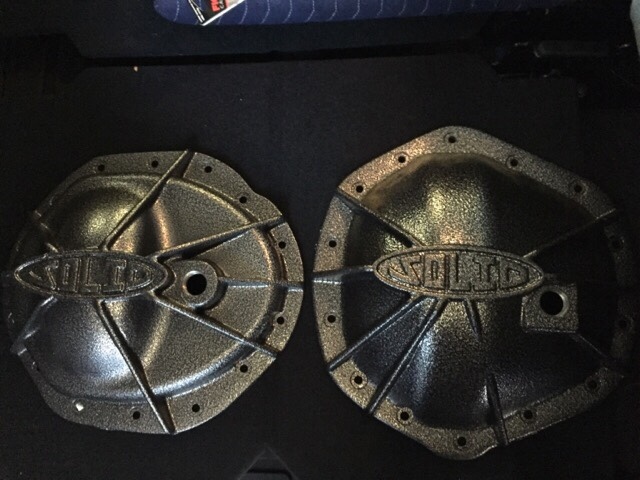 Speaking of diff covers, I bought these from SOLID a while back, turns out they don't fit my truck. My mistake, didn't verify before purchasing and didn't realize until a few months later. Going to put them up in the classifieds if anyone is interested. Supposed to fit AAM 9.25 and 11.5, I'll make sure they fit the '13 and down trucks today. I can check on my dads 3500. I changed my diff fluid at 5k miles when I installed filter mags. I thought it was important to get the mags installed because of the locker magnets and their tendency to fill with metal shavings. I have also hear of trucks delivering to end users with milky diff fluid so it all worked together. The next service will be in 30k miles. really great documenting your mods w/ adventures between...great material, enjoyed viewing it, thanks. adeluca73 wrote: really great documenting your mods w/ adventures between...great material, enjoyed viewing it, thanks. 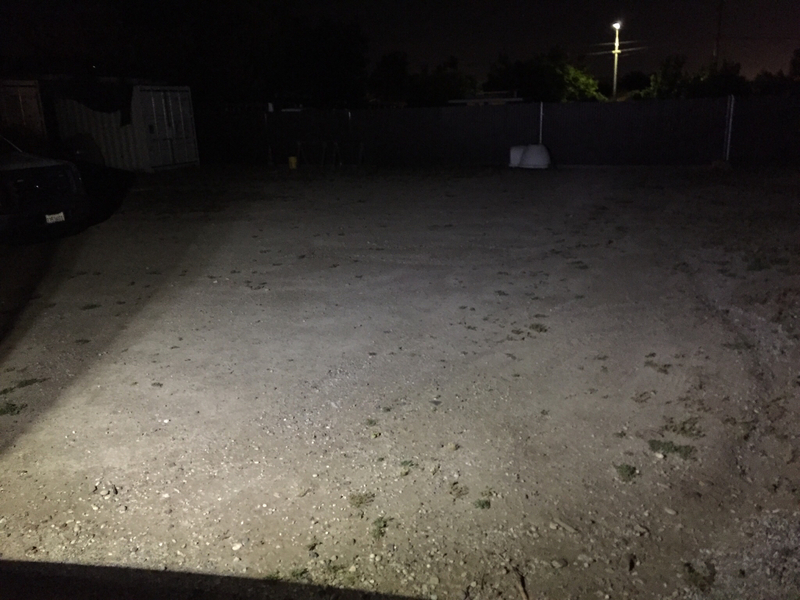 I finally got my Baja Designs S2 sport lights for the bed rack, until now I had been using some of the S2 pros I had off of my Ranger, they were driving pattern and way too focused for camp/area lighting. New lights are the work/scene pattern, plenty of projection and a nice smooth spread. I was happy to see the logo was just a decal, stealth mode! I've neglected this thread for a bit, only new addition as of late is a whole bunch more pin striping. 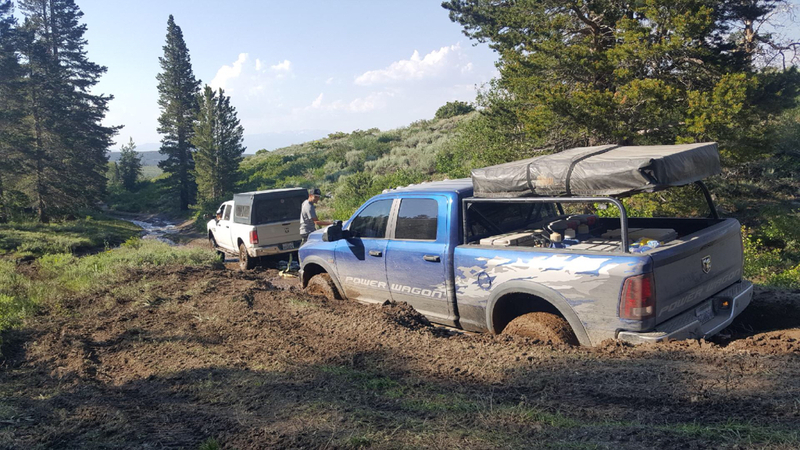 We've been lucky enough to go to some really awesome places in the past few months... Moab, Big Bear, Sedona, Flagstaff, and some trips up to the Eastern Sierra Nevadas. 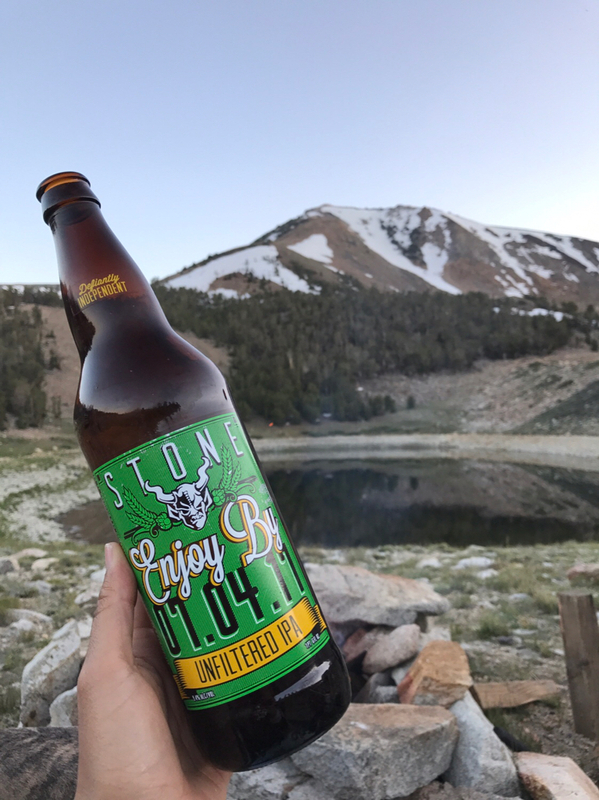 Here is a few pics from our 4th of July trip to the Sierras. The idea was to beat the heat back home and head for higher ground and cooler temps. 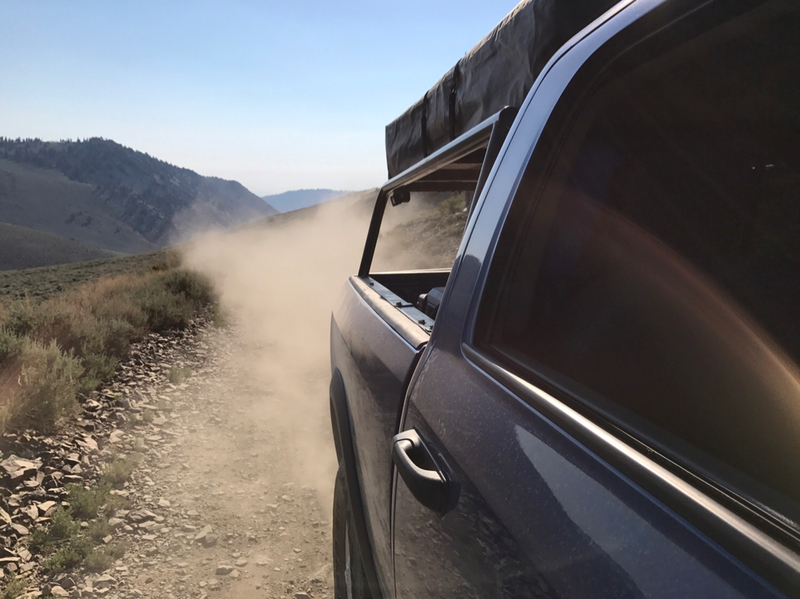 It was 101* F down in Bishop, and a comfortable 70* up at 9-10k ft above sea level. 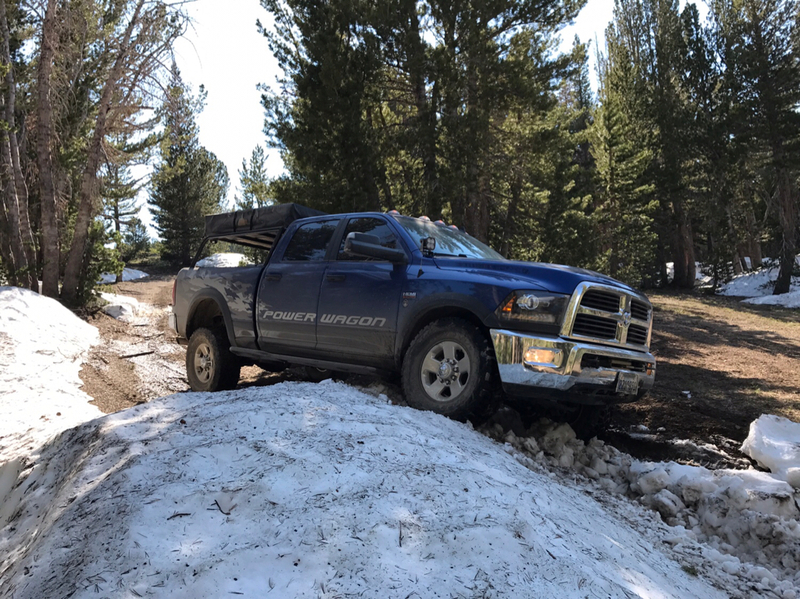 Still some snow, enough to block 2 trails we really had been hoping to run, so we improvised. 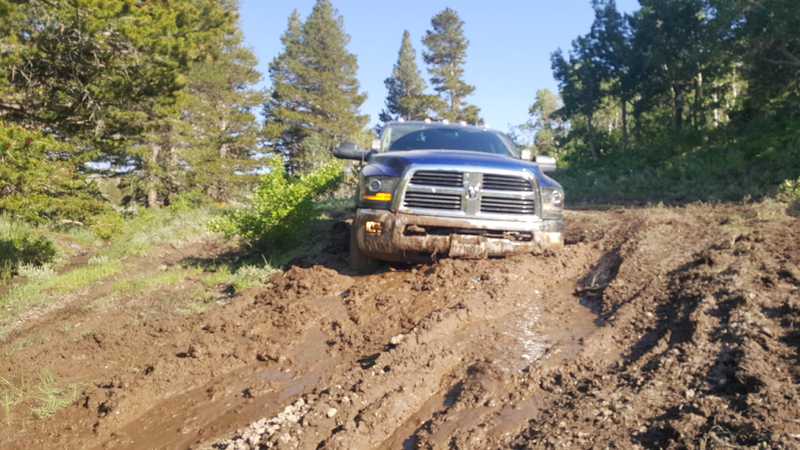 My buddy did me a favor with his heavy Cummins and loosened up this muck enough for me to sink down straight to the axles.... I was sabotaged. Totally not driver error, I also blame the tame Toyo RT tread, definitely not my late throttle application . Hard to tell here, but if you look at the bottom of the grille, you can see I killed two birds with one stuck and managed to realign the bumper when I sunk it. $#!+ happens, gives it character? 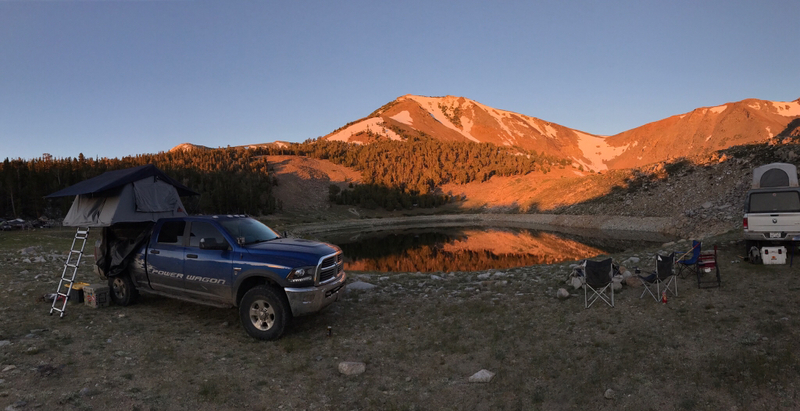 Sunrise at our 3rd camp, doesn't get much better! Thanks guys! 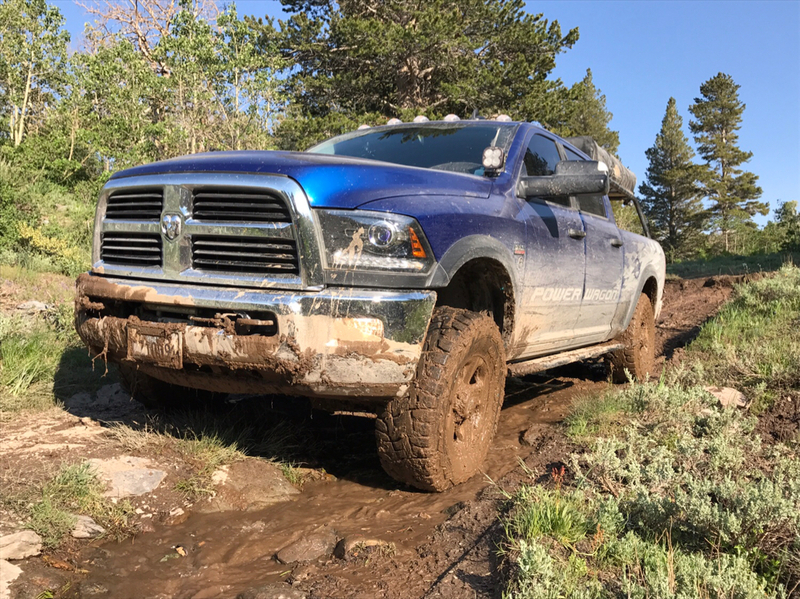 Loving this truck more as the miles click by. 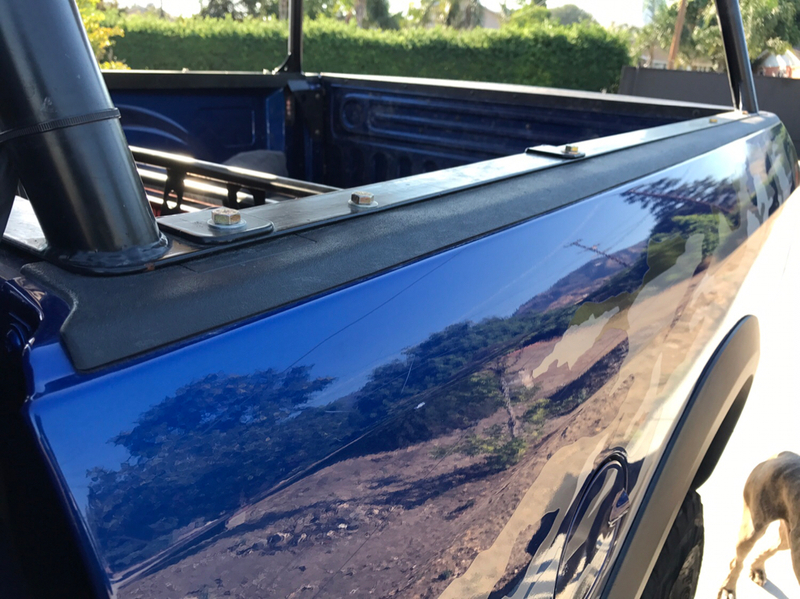 Can't believe it's been almost a full year with the Blue whale... for its birthday I think I'm going to break down and remove the tent rack to get the bed sprayed with line-x, as well as some other maintenance/prep I've been wanting to do. Nut/bolt check, diff fluid/filter mags, stuff like that. Question for those of you who have had the bed sprayed with a liner - are you leaving the plastic caps on the top of the bed rail in place, or spraying the top bed rail? I'm assuming there's some holes for clips along the top, never bothered looking underneath to see if it's a couple or a bunch. 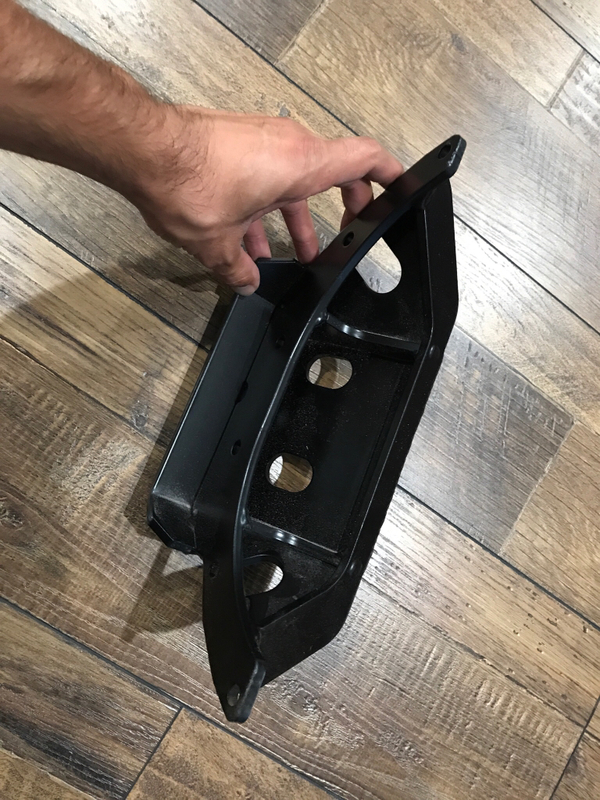 Reason I ask is when the bed rack gets tightened down, I have to back off the front bolts a bit to keep that plastic cap from getting smashed and all wavy. Here's what I'm talking about for reference. 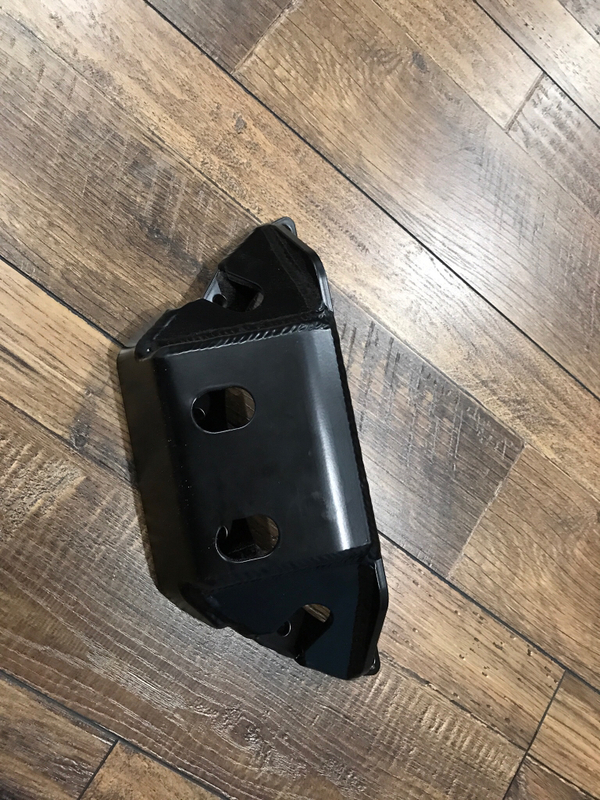 This is with those front bolts backed off a bit to avoid the bending of the plastic cap. 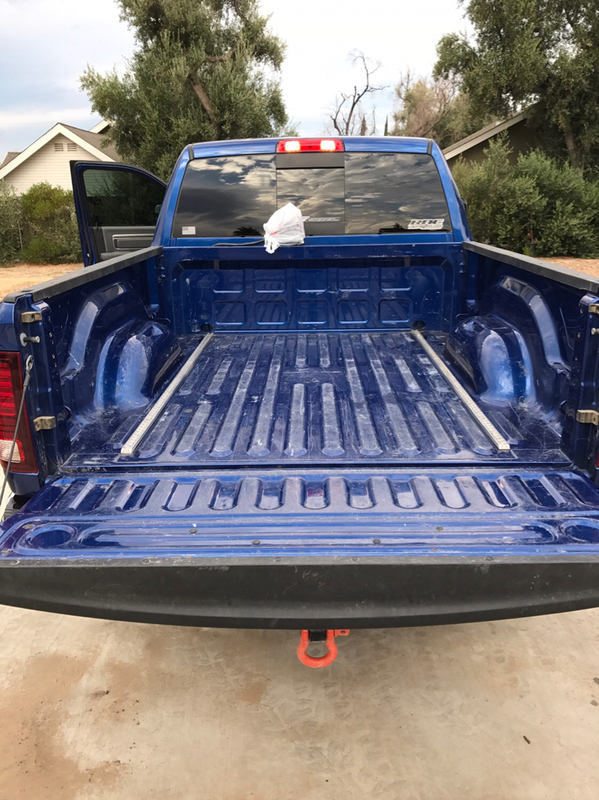 My truck has factory bedliner and the plastic caps. I've never taken them off to see what the liner looks like underneath. I clamped my camper straight onto the plastic rails, sorry can't help man! If you're doing a thin liner you could do it under the caps, if doing thick I probably wouldn't. 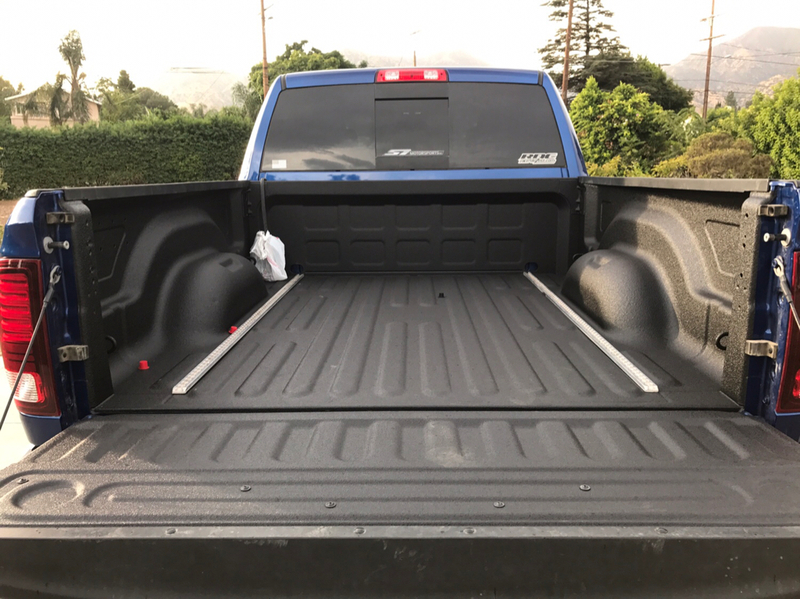 Either way another option is to ditch the caps and so the liner over the tops like a lot of guys do, basically covering the bed rails with liner. yellowranger1 wrote: Question for those of you who have had the bed sprayed with a liner - are you leaving the plastic caps on the top of the bed rail in place, or spraying the top bed rail? I'm assuming there's some holes for clips along the top, never bothered looking underneath to see if it's a couple or a bunch. Thanks for all the responses guys. Tomorrow is 1 full year of ownership, I have the day off so I'll pull the tent and rack off, and get my power tank bracket mounted so I'm not drilling holes after the fact. Going to call and see if I can drop the truck at line x Thursday or Friday, I'm going to have them spray the top of the bed rails. Got busy with work and had to reschedule Line-X, finally got it done today. Look too pretty to step in now! Damn! I forgot how nice fresh linex looks. Is that macs tie down track in the bed? How do you like it? Looking sharp man! Last edited by yellowranger1 on Wed Aug 02, 2017 10:21 pm, edited 1 time in total. Agree on that skid Marcus, let me know! Colibri wrote: Damn! I forgot how nice fresh linex looks. Is that macs tie down track in the bed? How do you like it? Looking sharp man! Same difference, I ordered from US Cargo Control, love it! I does fill with debris, dirt/bark from firewood, etc. quick blast with the air hose takes care of it though. I love being able to move the tie down points to exactly where I need them, rather than a few set points. Thanks!